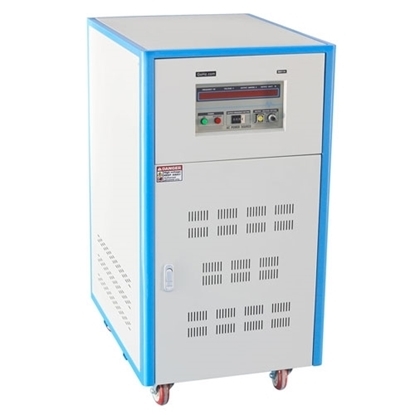 Highly reliable 15 kVA solid state frequency converter, 220V/230V/240V 50 Hz input to 110V/120V 60 Hz output (vice versa), make international 50/60 Hz power system compatible easily. It mainly discusses the rotating body of the motor. For instance, when the 60Hz motor is connected with 50Hz power supply, under the premise of unchanged voltage, it can be known that the rpm reduces for 1.2 times when the frequency lowers for 1.2 times, the magnetic flux increases for 1.2 times, the no-load current increases. As the reactance value decreases, the starting current increases accordingly. If the voltage of the power supply is not reduced, the motor output torque will be increased. The temperature rise of the motor winding will rise. As a result, the motor might be damaged after being operated for a long period. Meanwhile, because of the breakage of the motor revolving speed, its air circulation decreases, resulting in the reduced ventilation quantity and weakened heat dispersion.